Do You Want Sugar With That? This blog likes to pride itself on not following trendy fads while also emphasizing a healthy lifestyle. Something caught my I eye that other day while I was cooking. I often use diced frozen onions in recipes, they’re convenient, but mainly it’s because chopping onions makes me cry horribly and leaves me with mascara smeared raccoon eyes. Anyways, I was checking out the packaging on the onions. It had the usual phrases, “No Additives” and “Cholesterol Free”, but then I was struck by one that seemed out of place: “No Sugar Added”. Is this a real concern? Is there an insurgence of sugar laden onions on the market? Maybe we haven’t gone as far as candied onions, but our society has become overloaded with sugar and most of it is hidden in plain sight. Remember when there was a cereal called Sugar Smacks? I can respect a product like that because you knew exactly what you were going to get, they weren’t trying to hide anything. I miss the honesty of those days. You try to eat healthy, but as I’m sure most of you are aware sugar is hidden everywhere. It’s a cheap additive to make products more delicious. Avoiding hidden sugar can be tricky. 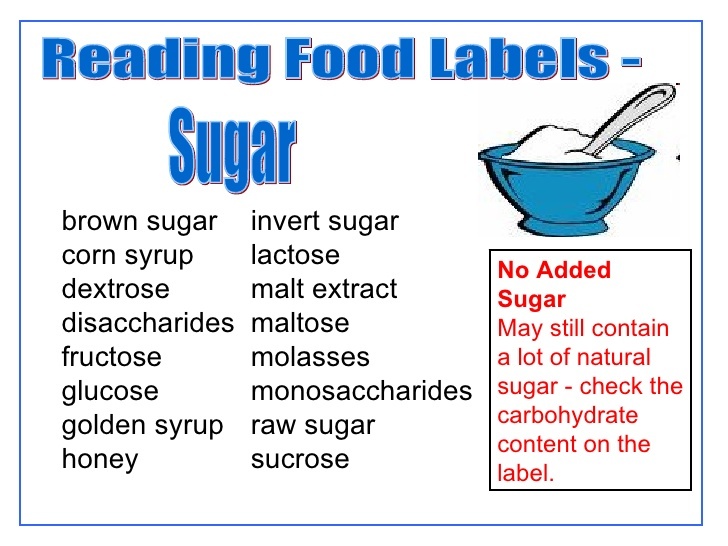 READ LABELS: You may think that you are shopping smart by purchasing healthy products like low-fat yogurt, but it’s important to read labels. Low-fat or fat-free versions of food usually contain more sugar than their whole fat counterpart to make the product taste more appealing. Fat-free mayo is another perfect example of this, the “diet” fat-free version can contain up to 10 times the sugar content as the full fat version. I’m not using this example as a licence to blow off eating healthy and eat full fat everything, but rather a cautionary tale to educate yourself. Other labels worth reading belong to meal replacement and protein bars. On the surface they seem like a healthy option when you are trying to eat on the run or needing a pick me up after a work-out. Again read the label, some of these bars are packed with so much sugar you would have thought you hit up the candy bar rack. CUT BACK: Yes, it’s perfectly acceptable to treat yourself, but be aware of what you’re putting in your mouth. Maybe you have a habit of getting through Monday morning with a large blended coffee. 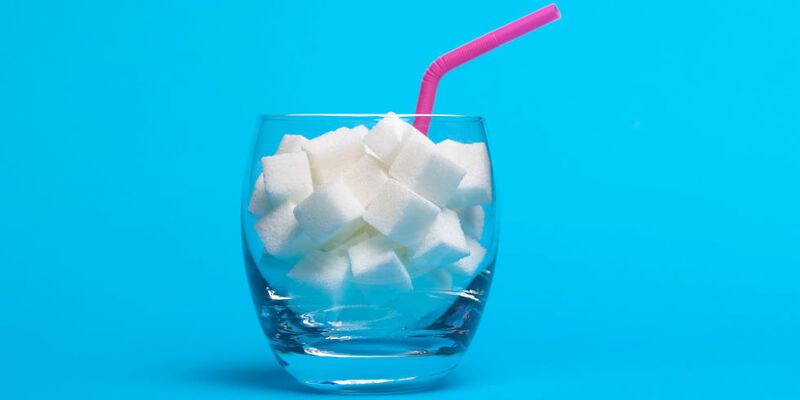 Do your research, the frothy deliciousness can hide a ton of sugary syrups that pack upwards of 20 teaspoons of sugar in your cup-that is the equivalent of drinking a liter of cola. I’m sure your intent was not to sit down and consume 4 times the daily recommended amount of sugar, but unfortunately that is what’s happening. You can still have your coffee treat, but make sure you know what you’re consuming. I admit that I’m a creamer junkie. I never went for the crazy flavored creamers, instead opting for the “healthier” all natural, no-additive Sweet Cream. One day I realized I was going through a lot of creamer. I began to think, how many calories and sugar am I adding to my morning ritual? When cutting down on anything, especially sugar, it’s hard to go cold turkey, you often dislike the radical change and go back to your old habits. I found a tip, in I Quit Sugar by Sara Wilson, to first cut your creamer intake by half and substitute milk for the other half. From there you can continue to step down. I was skeptical at first, but quickly realized I didn’t miss my sweetened creamer. I might even be a black coffee drinker before long. SUBSTITUTE: Eating out can be another area where avoiding sugar can be tricky. 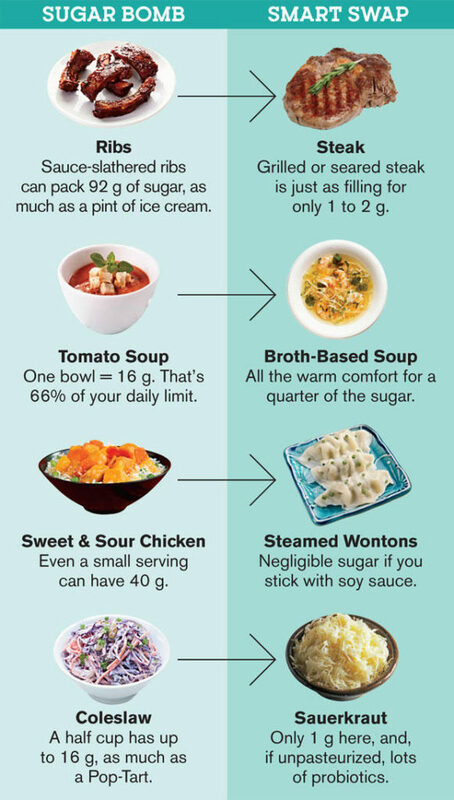 Don’t feel that you can’t go out and have healthy enjoyable meal, but why load up on hidden sugar throughout the meal when easy swaps can be made. This chart of easy swaps, from Prevention, can help you avoid some of the land mines. Sugar consumption is a lengthy topic that I just scratched the surface on. Hopefully you will take away the key points of educating yourself on what you’re putting in your body and reducing your intake. After cutting back on sugar, you may find yourself feeling better, more energetic and possibly lose a few pounds.